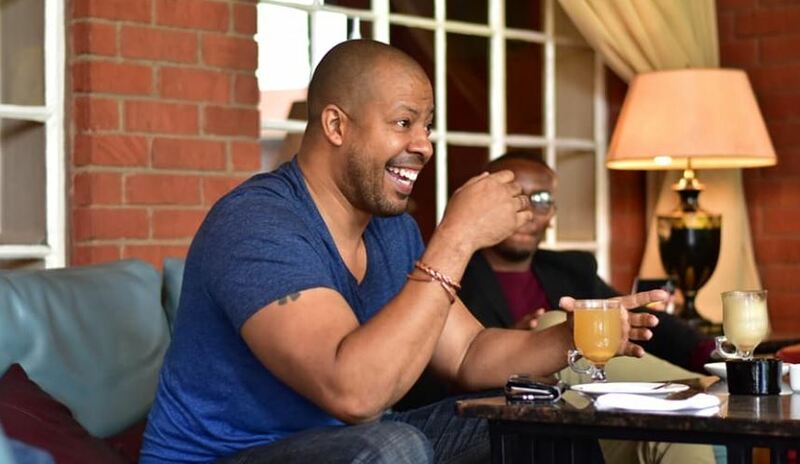 American actor and director Morocco Omari was in Kenya recently for a two-day acting workshop at Kenyatta University. Omari, who is a former marine, talked to Sunday Nation about his rough upbringing in Chicago, joy, and his heartbreak when explaining to his young daughter why he was arrested on a domestic battery charge. My first trip to Kenya was in 2006 on holiday in Mombasa. This is my second stint in Nairobi, having been here last year too. What I can say about Kenya is that the people are still beautiful and warm. Coming to the continent is always refreshing and feeds my spirits. Every country I go to helps me learn something culturally different that I walk with back in America. I grew up in the West side of Chicago and it was rough. There were gangs, drug dealers, drug addicts, pimps, prostitutes and of course blue collar workers and some homeowners. It was just survival. We did not have the opportunities and, as children growing up, we didn’t know what was bad. So I got in my share of fights, watched men shoot up heroine or overdose on heroine as a young child — things I shouldn’t have seen early on in life. When you don’t have what we deem as successful people like engineers, doctors or lawyers come and mentors us, we had to figure life out ourselves. Luckily, my mum sent me to stay with my dad in my high school years. I got to see a different side of life then went to college and ended up in the Marine Corp. In the Marine Corp we have a never say die attitude. It installed a lot of discipline in me; I went in as a teenage boy and came out as a man. You have to adapt and overcome a lot of things. Fighting a war, I didn’t need that. But the discipline part of it and believing in yourself and getting more confident helped a lot, and I apply that to life and my craft and trade. I never wanted to shoot a gun again. I went through all the training and took all the tests because I wanted to make money. Afterwards, I went back to school and majored in Business and had one acting class. I always looked forward to this acting class. In acting, I had to be creative. So, I took more classes outside the university and I got cast in my first play. That’s when I had a light bulb moment. It took me back to when I was young; I was always a storyteller and I could imitate people who came in and out of my life and doing school plays. Being on that stage and getting paid for it; this was the feeling I felt on the football field or the adrenalin on the battlefield. I decided that this was what I’m going to do. I have learnt that there is no shortcut to success. A lot of people wake up and say they want to be actors but they don’t understand what it takes to be an actor. Hard work pays off. I had to learn this craft, I had to grind; take the shape of water. You have to be careful what you ask for. We all have a different definition of success. If people want to get in here and be famous, that is a lot of responsibility; you’ll have no more anonymity and you’ll be held under a microscope. I had been a fan of Terrence Howard and Taraji P. Henson for years, and when I got cast as Tariq Cousins it was a big role for me. When you work with them, you have to be ready because those two can throw anything at you; they are masters of the craft. Come ready to improve or you will be chewed up. I support the #MeToo movement. These are stories of men and women who have been abusing their power. We’ve known about it and it’s about time. On the flip side there are incidents where it can be, “what’s going on here?” If you’re guilty, you’re guilty and you should pay for that crime. It has opened a lot of things. I can go on and on, but like I said, I support it. We should hold our queens up and honour them instead of disrespecting them. As a father of two girls, the beautiful thing is my family and friends, people knew me, knew that the accusations (of domestic battery) were BS. We shielded the younger one, who was eight at the time, as much as we could. People on social media and tabloids didn’t understand. My accuser wanted money but I said I’m going to fight it. My youngest child is proud of me and she wanted to do an article about me in school. She went online, typed my name, and that is what came up. She burst out in tears and when she came home, she asked me if I had beaten mummy. I had to sit her down and have a conversation with this beautiful bundle of love who was looking at me suspiciously. I gave her my word that I will clear our name. We went to trial and the jury came back with a not-guilty verdict. 17 Bridges will be out in July. It was great working with Chadwick Boseman on what will be his first main role movie after Black Panther. I’m sure this cop movie will be a big blockbuster. Describe yourself in three words — Intense, loving and hardworking. Have you ever milked a goat? — Nooo, I’ve never milked a goat. If you could be any animal, what would you be? — An elephant. What is the one thing that annoys you the most? — Racism. Which celebrity annoys you the most? Ahhh, I don’t want to get in trouble. One word to describe your computer ability — Oh man, basic. Boxers or briefs? — I’m a boxer/brief person but I’ll say boxers; I need room. Describe the perfect kiss in three words — Eye contact, full lips and Black woman.